Don’t act like you haven’t already been stuffing your face with bags of chocolate in the name of Easter. It’s okay, we totally get it—not all of us are blessed with the ability to hate chocolate like Tyra Banks. That said, we’re here to up your chocolate-eating Easter game a little. Because what’s life without a little gourmet action every now and then? Local favourite Mr. Miyagi just launched ‘Mr. 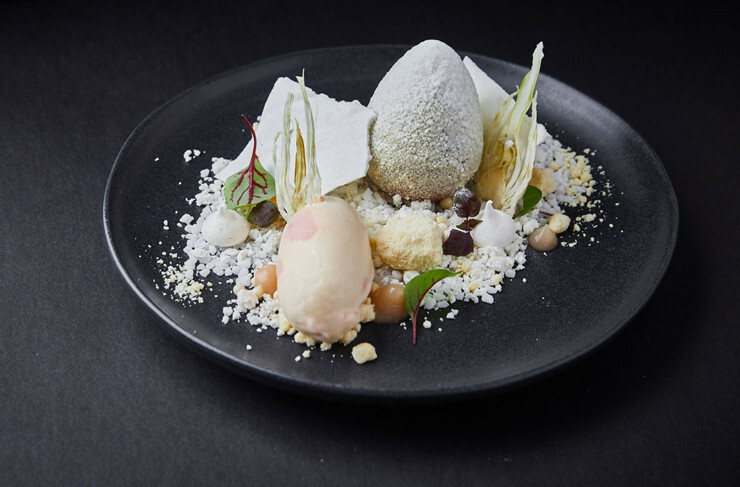 M’s Epic Easter Egg’, which is a dizzying combination of chocolate and yuzu cream egg, champagne and peach ice cream, salted white chocolate biscuit, dehydrated yuzu meringue shards, and orange olive oil snow. Does that sound gourmet enough for you? Because it sounds like an epic trip down Flavour Explosion Lane to us. So put away those damn misshapen supermarket chocolate abominations and get your hands on an Epic Easter Egg like, yesterday, because they’re only available in limited quantities and for a limited amount of time. This whole gourmet Easter extravaganza will only set you back $24, which is a total bargain considering some sad-looking Easter chocolate bunnies go for $80. For more details, head over to Mr. Miyagi. Have you tried Melbourne's $28 katsu sandwich yet?